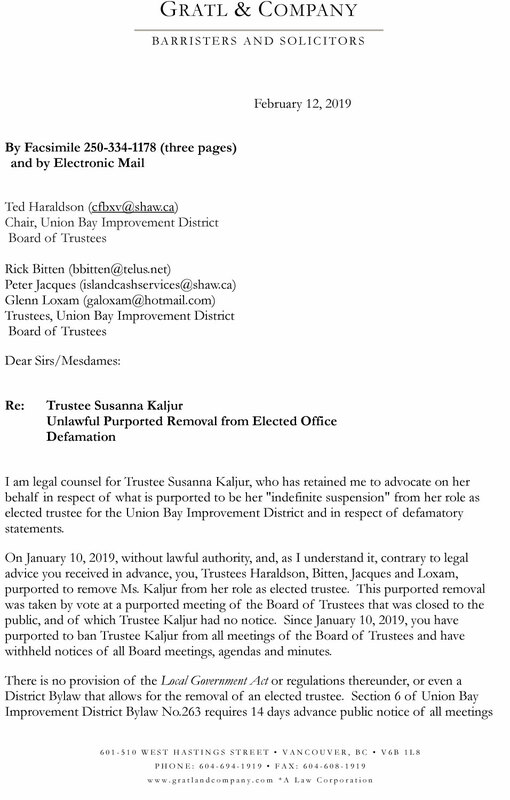 Suspended Union Bay Improvement District trustee Susanna Kaljur has threatened legal action against the other UBID trustees – Ted Haraldson, Rick Bitten, Glenn Loxam and Peter Jacques – claiming her suspension from the board has no legal standing. 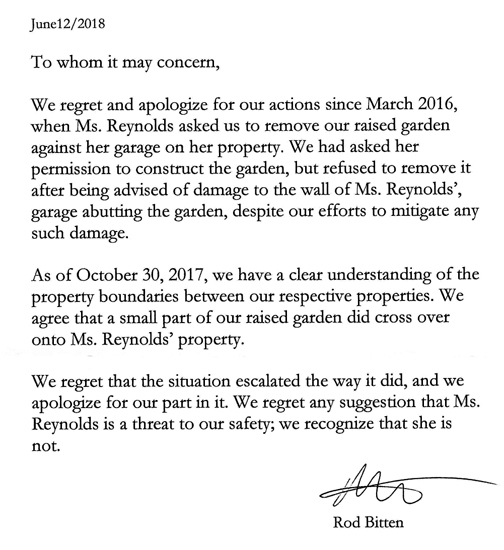 She has also demanded a written apology from UBID chair Haraldson for “false and defamatory” statements published on the “Comox Valley Now” (sic) online newspaper. 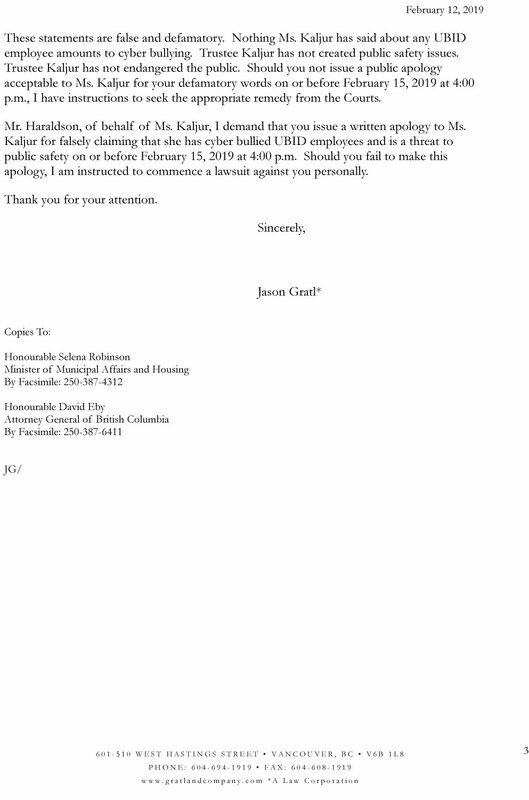 A Feb. 12 letter to the trustees, sent by Jason Gratl, legal counsel for Kaljur, stated the Jan. 10 decision to suspend Kaljur indefinitely is baseless. “There is no provision of the Local Government Act or regulations thereunder, or even a District Bylaw that allows for the removal of an elected trustee,” Gratl said in the letter. 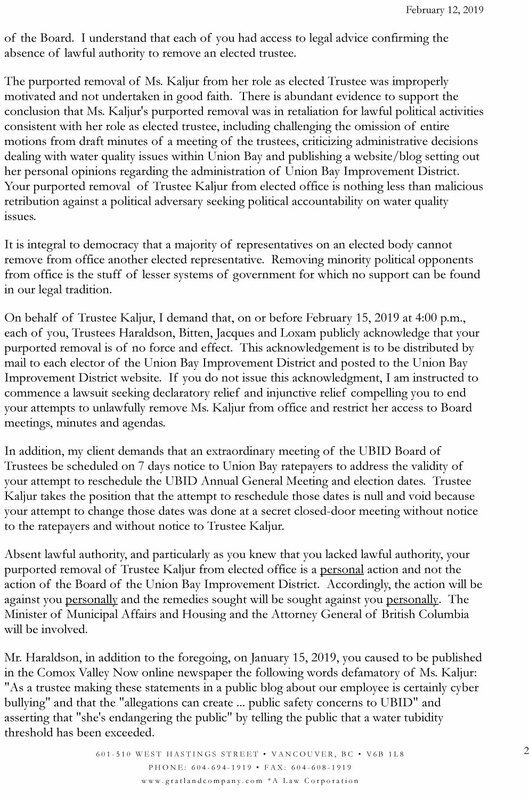 The letter goes on to insist that each one of the aforementioned remaining trustees “publicly acknowledge that your purported removal is of no force and effect,” and demands that the acknowledgement be mailed to every elector in the Union Bay Improvement District. It offers a Feb. 15, 4 p.m. deadline for the acknowledgement, to avoid a lawsuit. The second part of the letter deals with a quote Haraldson is alleged to have offered to the Comox Valley Now (sic) online publication. The Feb. 12 letter addresses the following quotes: “As a trustee making these statements in a public blog about our employee is certainly cyber bullying” and that the “allegations can create … public safety concerns to UBID” and that “she’s endangering the public” by telling the public that a water turbidity threshold has been exceeded. Gratl then requests a written apology from Haraldson to Kaljur, with the same Feb. 15 (4 p.m.) deadline. Kaljur expects the board to comply with the demands listed within the letter. When Haraldson was contacted by The Record for comment, he said, in both instances, there has been no decision regarding any response to the requests. Kaljur is hopeful of a resolution, stating that, as an elected official, she has a responsibility to her constituents. Next Post UBID needs competent/qualified Admin to avoid stupid mistakes by trustees – like suspending an elected trustee!